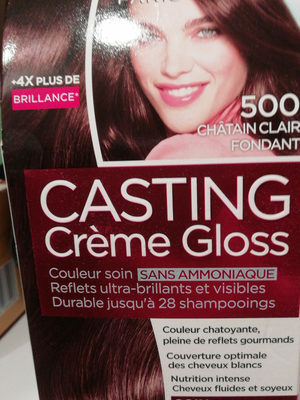 CREME COLORANTE: AQUA/WATER, CETEARYL ALCOHOL, PROPYLENE GLYCOL, DECETH-3, ??? ?, OLETH-30, LAURIC ACID, POLYQUATERNIUM-6, GLYCOL DISTEARATE, TOLUENE, ?? ?METHRINE CHLORIDE, SILICA DIMETHYL SILYLATE [NANO] / SILICA DIMETHYL SILYLATE, CI 77491 / IRON OX??? DIOXIDE, 2,4-DIAMINOPHENOXYETHANOL HCI, m-AMINOPHENOL, ASCORBIC ACID, MICA, SODIUM ?? ?GLYCERIN, 2-METHYLRESORCINOL, CARBOMER, RESORCINOL, EDTA, PARFUM/ FRAGRANCE. LAIT REVELATEUR : AQUA/WATER, HYDROGEN PEROXIDE, CETEARYL ALCOHOL, SODIUM ?? ?ECETH-2 CARBOXAMIDE MEA, PHOSPHORIC ACID, CETEARETH-25, TETRASODIUM ETIDRONATE, ?? ?PHOSPHATE, GLYCERIN. SOIN BAIN DE BRILLANCE ENRICHI EN GELÉE ROYALE : AQUA/WATER, CETEARYL ALCOHOL, BE?? ?, PEG-180, MYRISTYL ALCOHOL, CETYL ESTERS, CI 77891 / TITANIUM DIOXIDE, CI 17200 / RED 33, CI ?? ?, HYDROXYETHYLCELLULOSE, PHENOXYETHANOL, ACETIC ACID, TRIDECETH-5, TRIDECETH-10, DIMETHICONE, LINALOOL, BENZYLALCOHOL, ISOPROPYL ALCOHOL, AMODIMETHICONE, ALOE BARBADENSIS LEAF JUICE, PARFUM, CITRIC ACID, CITRONELLOL, BHT, HEXYL CINNAMAL, GLYCERIN, AMYL CINNAMAL, ROYAL JELLY. Product added on January 7, 2019 at 2:46:18 PM CET by openfoodfacts-contributors. Last edit of product page on March 5, 2019 at 12:04:00 AM CET by khorkaadren. Product page also edited by nicolas97, sebleouf, teolemon.